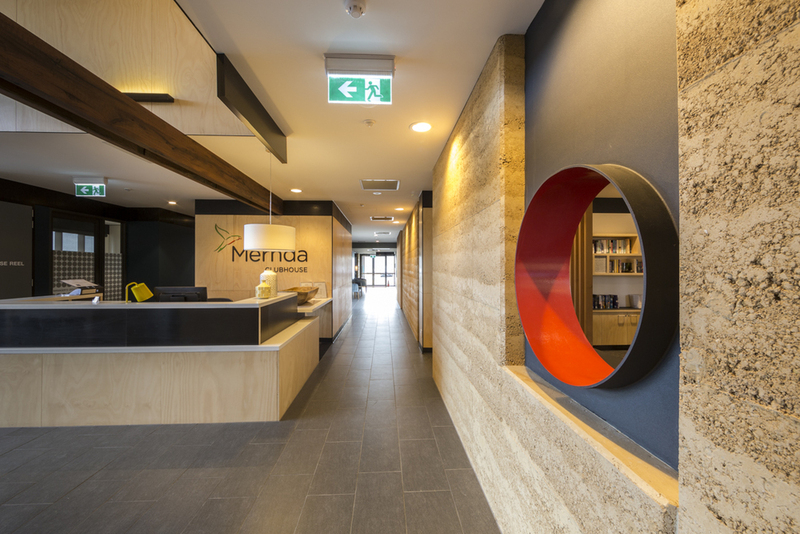 Stockland engaged Six Degrees to design the Mernda Clubhouses, which gained a 4-Star Green Star accreditation from the Green Building Council of Australia in July 2015 (For an Overall Village Rating). The clubhouse building flanks the southern and western edge of the site, reinforcing the northerly orientation and capturing the morning sun. From arrival, movement is through the buildings layers and along the East-West circulation corridor to the Northerly ‘Town Square’ – a series of social spaces including bar, dining (able to cater for large functions up to 170 people), lounge, billiards, pool and gym which have a northerly orientation and open up onto the bowling green, productive garden and contemplative park. Private spaces including wellbeing, doctor, hairdresser, offices, kitchen and services have a southerly aspect and act as a buffer to the road and carpark. Rammed earth walls begin to define spaces, and are complemented by other warm materials such as plywoods, fabrics and carpets to create a comfortable, welcoming environment.